Bangladesh has got thousands years of tradition and culturally, traditionally & religiously the representation of those heritage is being reflected through the Tangail Sharee. In the context of Bangladesh, women have got huge fascination for Tangail sharees. 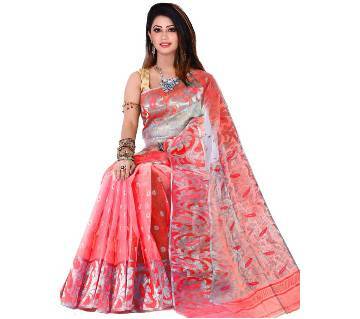 Basically, you can find Tangail sarees all across the Bangladesh but the problem is you need to move a lot to find your favorite Tangail share. Sometimes, you may not find your favorite Tangail sharees after a lot of pursuit. In some cases, it has been seen that, during a marriage ceremony or any kind of occasions, you need to travel a long way to ensure the best quality of Tangail sharee. But, if you find online, you can get good quality Tangail sarees from AjkerDeal.com. AjkerDeal.com, the largest online shopping site of Bangladesh, has got a huge collection of Tangail sharees in its exclusive saree section. Among those Tangail sharees, you will get the fabrics like cotton, silk or santoon. On the other hand, you will also find the combination of tangail and taant on this online shopping platform. Usually, in case of marriage, every family member wants to be the contributor of choosing the sharee. Going for shopping with all those family members seem very much problematic. But, all those family members can be a contributor if you shop from an online shopping site. At the same time, it will save your time and money as well. So, what are you waiting for! Grab your favorite womens fashionwear from ajkerdeal.com.